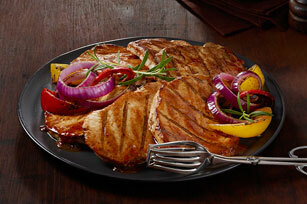 Throw pork steaks on the grill to make Tangy Grilled Pork Steaks! Taste these spicy-tangy pork steaks and you'll wonder why you don't do it more often. Mix first 3 ingredients; pour over steaks in shallow dish. Refrigerate 1 hour to marinate. Heat grill to medium-high heat. Remove steaks from marinade; discard marinade. Grill steaks 5 to 6 min. on each side or until done (145ºF). Remove steaks from grill. Let stand 3 min. before serving. Prepare using A.1. Sweet Chili Garlic Sauce. Prepare using bone-in or boneless pork chops. To broil steaks instead of cooking them on the grill, place steaks on rack of broiler pan 4 to 6 inches from heat source. Broil 5 to 6 min. on each side or until done (145ºF). Remove from heat. Let stand 3 min. before serving.